In the collector car auctions’ relentless series of events there is rarely an opportunity to sit back and take stock. At most it becomes an occasional consideration of the major events of Scottsdale, Retromobile, Amelia Island or Monterey. 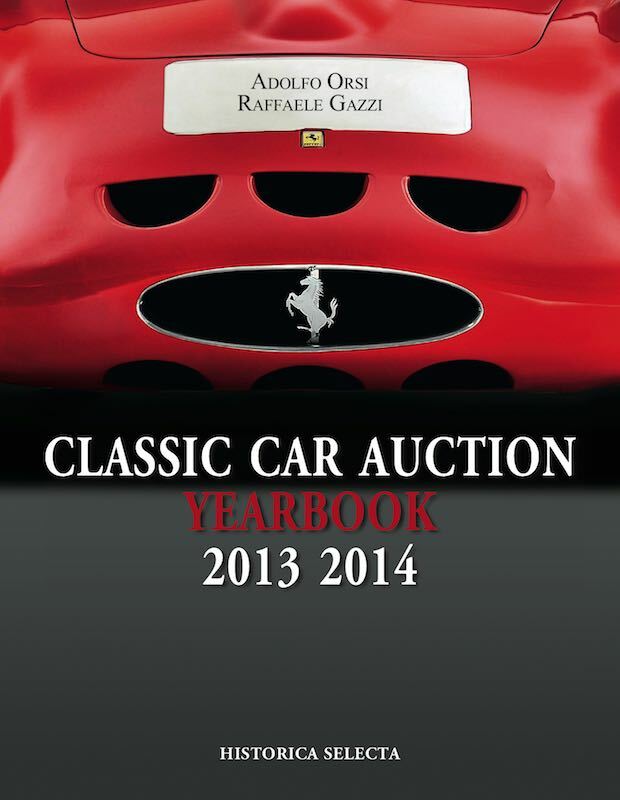 Adolfo Orsi and Raffaele Gazzi provide the opportunity each year with their Classic Car Auction Yearbook to reconsider all the major sales in one thoughtful, illustrated, well annotated summary of the major collector car auctions in the U.S., U.K., Europe and Australia. Record prices, ever-increasing sale totals in multi-million dollar amounts and one fabulous wish-list car after another (no matter what car is on a particular collector’s wish-list) create a nearly bewildering series of individual impressions. 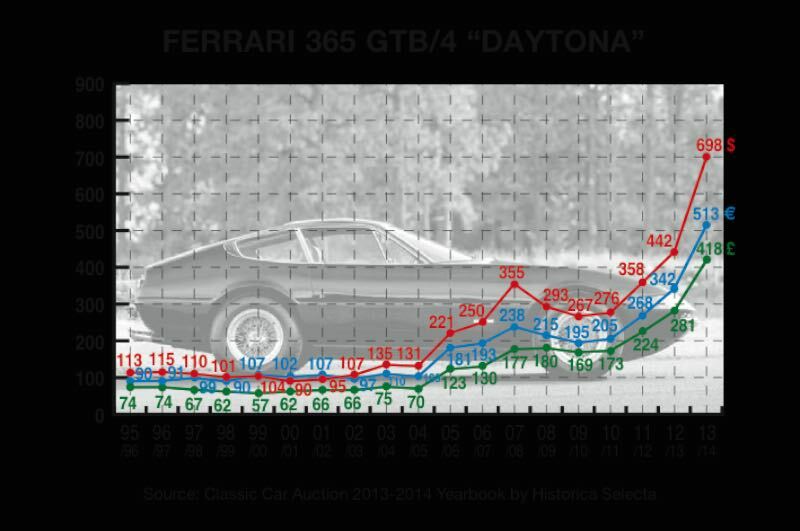 Even though those impressions build up over time to form a mental image of the market’s progress, the Classic Car Auction Yearbook puts the entire year into perspective and is a welcome chance to refresh, and usually to adjust, recollections and their significance. For me, despite being constantly engaged in presenting and interpreting collector car auction transactions, the arrival of each Yearbook is pleasantly anticipated and I learn a lot from each issue. The individual transaction notes include references to prior sales. 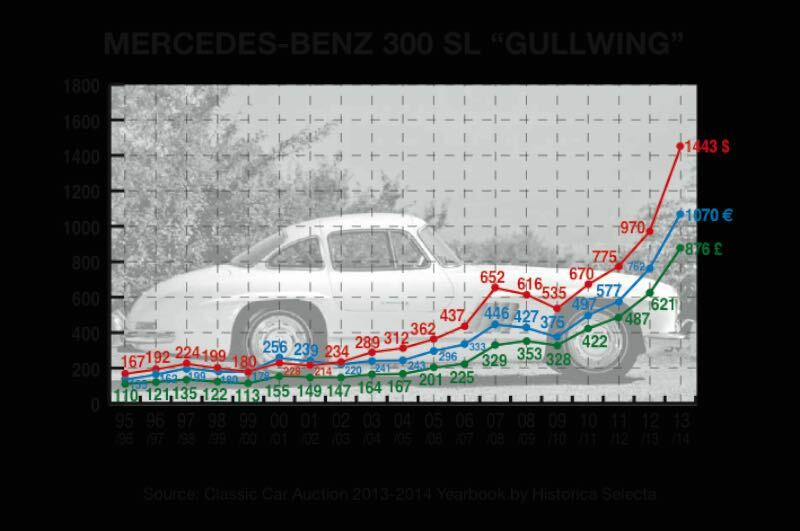 One of the most valuable presentations is in the front of the book where a selection of twenty-four important cars with two or more auction transactions are graphed over time. In general the lines’ slopes are dramatically upward, even for pre-WWII performance cars (Alfa 8C-35, Bentley 8-Liter and Bugatti Type 35.) More stately antiques (1911 Mercedes 38/70 and 1913 Rolls-Royce Silver Ghost) are the only laggards, declining modestly in contrast with the handsome increase seen by the 1930 Cadillac 452 V-16 Roadster. The market snapshot may best be expressed in a single page of graphs showing the average prices achieved for several important models. Orsi and Gazzi have chosen wisely, selecting 300SL Gullwings and Roadsters, Aston Martin DB4, XKE 3.8, Ferrari Daytona and Dino 246 GT, all cars that were built in fairly consistent specifications and equipment. The highest and lowest transaction results are ignored to minimize the effect of outliers. The graphs for 300SLs, Dinos and Daytonas look like the famous “hockey stick” graphs of early climate alarmists, modestly increasing for years before jogging rapidly up in recent years. The Series I 3.8 E-type graph confirms what has been observed in individual transactions both during the Yearbook’s period and subsequently: prices were steady for years but are took off in 2013-2014. The $183,000 average for the Yearbook’s 2013-2014 period is going to look modest when the 2014-2015 data is crunched. The real meat of the Classic Car Auction Yearbook is in the 322 pages that follow with 4,763 individual transaction reports from Abarth to Wolseley arranged alphabetically by marque, then by year and model for relevance. It is impossible to over emphasize the importance of the brief notes of condition, equipment or history that amplify each transaction’s listing as well as a reference to prior auction transactions for the same car or the catalog photos of selected cars which foot each page. There is a lot – no, that should be emphasized – a lot, of work that went into making the Classic Car Auction Yearbook both relevant and informative. That exhaustive attention to detail, concise summaries and excellent design are what makes the Classic Car Auction Yearbook so valuable, not only as the catalyst for revisiting twelve months of auction history but also as an invaluable reference work. It is available through Amazon for $75 and through major motoring book dealers in the U.K., Europe and Japan. Pause, catch your breath, consider and get set for another year, well informed and entertained.